Publisher: Listening Library, 2013; originally Dial Books, 2013 (240 pages). He's the smallest mouse in the Mews at Buckingham Palace, and he's an orphan without even a name. Aunt Marigold, the head mouse seamstress, raises him and sends him to the Mouse Mews Academy, but she won't tell him his name. Soon "Mouse Minor," as the other mice at the academy dub him, is on the run from bullies and looking for his identity. His quest takes him into the palace on the eve of Queen Victoria's Diamond Jubilee, and he survives a lot of adventures by just a whisker before finding himself--in more ways than one--in the presence of the queen of the mice. I have yet to find any tale by Richard Peck anything less than delightful. This one is no exception. 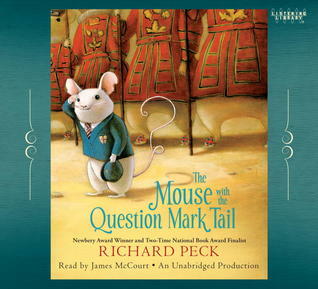 With a dry sense of humor and some asides that are aimed at the adults but won't hurt the kids, Peck takes us on a fast-moving adventure (because mice never have very much time) through the palace gardens, attics, and even Queen Victoria's bedchamber. James McCourt's reading of the story is perfect--his voice is just right, and he renders the first-person narrative so that I'll never hear that character in any other way! If I were giving stars, I'd give this one 5, for just being marvelous fun. This book is suitable for kids of any age, really, though the reading level is probably about age 9. Maybe 8; some kids will struggle a bit with references to things that are particularly British, or that are long since vanished from everyday use (it is, after all, historical fiction!). But my experience is that the adults worry more about that than most kids, who just accept stuff and read on to find out what will happen next to the intrepid Mouse Minor. FTC Disclosure: I checked The Mouse with the Question Mark Tail out of my (digital) library, and received nothing from the writer or publisher in exchange for my honest review. The opinions expressed are my own and those of no one else. I am disclosing this in accordance with the Federal Trade Commission's 16 CFR, Part 255: "Guides Concerning the Use of Endorsements and Testimonials in Advertising."